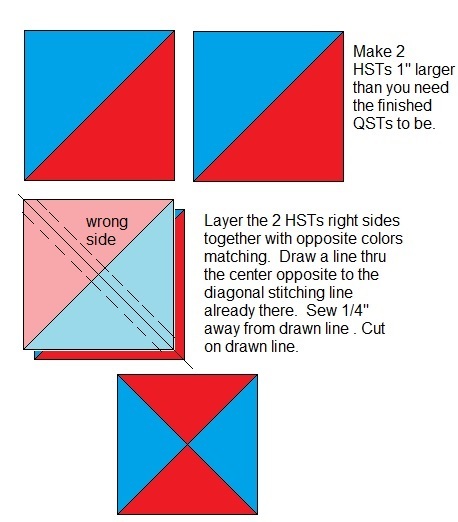 I Googled "how to make quarter square triangles" and found several free tutorials and videos. Maybe check them out and see which one you like best. http://www.mccallsquilting.com/mccal...uare_Triangles This is my favorite way to make them! That looks really easy. Thanks for information. I love this site because you learn something without even asking. Thanks Jan you are always ready to help someone out. You have easy to understand and do examples. Jan, you should assemble all of your great drawings into a spiral bound handy reference book. Thank you, Lisa, for the encouragement. Actually was planning that for this summer, but an unexpected right total shoulder replacement surgery coming up in 10 days has made my plans run amok! Pushing to finish a commissioned quilt as it is. I *want* to do this soon though! I agree. Hope your shoulder heals soon so you can do this. Thanks Jan! That is exactly what I was looking for! That's how I make quarter square triangles. I haven't made them for a long time and had forgotten how. You should have a Quilting Talk Show or something!! "Quilting with Jan". I'd pay to watch!!! Good luck with your replacement surgery, Jan. And best wishes for a speedy recovery and back to quilt and stuff. I found that using Jenny Doan's method from Missouri Star Quilts is really easy. hatever size block you need let's say a 5", then take two 5" squares of whatever colors you are using and place them right sides together, sew 1/4" all around the outside of the block. then cut from corner to corner diagonally on the sewn block making an x and you have your 4 triangles. Hope this makes sense. She has a tutorial on You Tube, can't tell you which one off hand, but you could search her tutorials for it. She always give a great video demonstration on her little tricks. Hope this helps! I put mine in a notebook and find it wonderful. Some of my students have "Ira notebooks" from handouts I've made for teaching classes. You'll love it all together. Any advice on the math part of the equation? Finished size = what dimensions for starting sqaures, triangles? Hope you do well in surgery. You always give great info. Have had 3 rotor cuff surgerys. @ in last year. Pain dr. said replacement might be next step. I am always happy to see your posts. They are so straightforward and easy to understand. Good luck on your shoulder replacement. I had that done about 10 years ago and the big secret is to do your therapy and keep up with it. I know several people who have had this surgery, haven't done the therapy as prescribed, then wonder why the surgery didn't help. Good luck.....I will be thinking of you! Wishing you much success on your up coming surgery, bless you and your recovery process. Good luck with your surgery ! And with the rehab afterwards! Once again, thank you, Jan. Good luck and speedy recovery from your surgery. Do your therapy religiously, and you'll be back to quilting in no time at all! The therapy is like magic. My prayers are coming your way. I agree with everyone else Jan I pray for a speedy recovery and you should look into publishing a book. Your advice is always straight on!